JEFFERSON CITY – This map shows the course of the total solar eclipse that will cut diagonally across the state of Missouri, Aug. 21. For more information on the eclipse, including traffick and safety concerns, visit www.mo.gov/eclipse and www.modot.org/eclipse. JEFFERSON CITY – Next month, the midday sun will go completely dark over Missouri for the first time in 148 years, and many Missouri Baptists plan to reach out to their communities during the unique event. 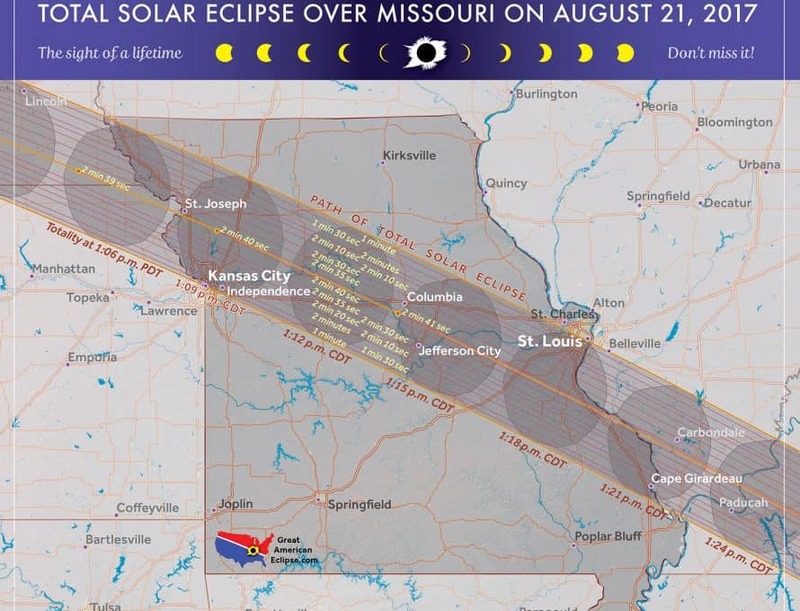 A solar eclipse will darken Missouri skies between 11:30am-3:00pm, Aug. 21, and is expected to draw at least 1.2 million visitors to the state, according to the Missouri Department of Transportation. All Missourians will be able to glimpse a partial eclipse (at least 90 percent of the sun being hidden from sight), but it will be possible to view a total eclipse of the sun within a 70-mile-wide diagonal pathway cut across the state, running roughly from St. Joseph in the northwest to Perryville in the southeast. The last time Missourians saw a total eclipse was on Aug. 7, 1869, although it only cut across the northeast corner of the state. Living near the center of the 2017 eclipse pathway, members of Santa Fe Trail Baptist Church, Boonville, plan to serve their community on the eclipse day. Located just north of I-70, the church is opening its property up for people to park self-contained campers/trailers and view the eclipse. According to Pastor Kenneth Tounzen, this will not only help to ease the heavy traffic in the area, but it will also give church members an opportunity to interact with both Christians and non-Christians coming out to see the eclipse. Likewise, members of First Baptist Church, De Soto—also located near the center of the eclipse’s path—are planning for large crowds to flock to their parking lot for the event. They’re expecting several busloads of children from Maryville, Ill., as well as other visitors. They plan to sell concessions for the support of missions and to have stations set up for sharing the gospel. In northwest Missouri, the Grand Oaks Baptist Assembly—a campground in Chillicothe—has planned the “Wonders of Creation Solar Eclipse Family Retreat” for Aug. 20-21. The retreat will include family-fun activities like mini-golf, hiking and swimming, but it will also include worship and an opportunity to learn more about the eclipse and God’s creation from a Christian perspective. “Since we’re in the range of the eclipse, we thought we were in a position to do teaching and ministry for families,” Don Boyer, manager of Grand Oaks Baptist Assembly, said, adding that he hopes this event kicks off an annual back-to-school retreat for families at the campground. The retreat costs $20 per person, and $80 maximum per family. To learn more, visit www.grandoakscamp.org. Also, in Jefferson City, Concord Baptist Church is hosting a “Solar Eclipse Seminar” on Sunday, Aug. 13, featuring keynote speakers Jim Johnson and Jake Hebert of the Institute for Creation Research (www.icr.org/event/1790). Open to the community, the seminar will highlight biblical perspectives about the eclipse and other features of God’s creation. The Aug. 21st solar eclipse will span the whole nation, in a path from Oregon to North Carolina, for the first time since 1918. To learn more about the eclipse in Missouri, visit www.mo.gov/eclipse and www.modot.org/eclipse.